This colourful and happy little horseman rocks back and forth encouraging fantasy play whilst simultaneously teaching cause and effect. 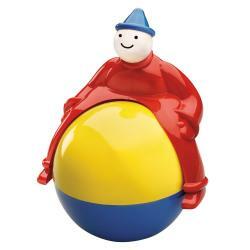 AMBI Toys is an Italian brand of classic, infant toys for 0 to 2 years old. Made with high quality, safe plastic, AMBI Toys are lightweight, colorful and chunky, and durable. Babies and toddlers are not interested in passing trends. They need well designed and reliable toys which encourage their gradual discovery of themselves and the surrounding world. AMBI toys satisfy these needs and are a continuing source of learning and fun. Exactly what a good toy is meant to be!